Are penguins found in Africa? --Casey of Cleveland, OH, U.S.A.
Africa does, indeed, have penguins. 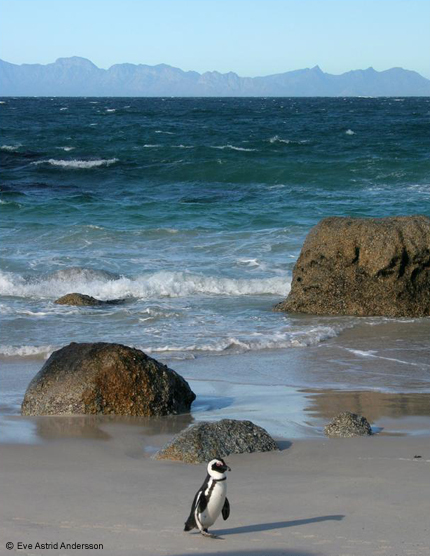 Let’s travel now to the beautiful land of southern Africa where the African Penguin (Spheniscus Demersus) is a must-see, attention grabbing native. The African Penguin (also known as the Black-Footed Penguin, and because of its braying vocalizations, the Jackass Penguin) stands approximately 28 inches in height and can weigh between 4-11 lbs. Besides its distinctive vocalizations, this penguin is most identified by the long, black stripe across its chest, which is also dotted with small black spots. Each pattern of spots is unique to each penguin, much like the stripes of a zebra or fingerprints for human beings. As with the stripes of zebras on the savannas, the black and white coloring of the penguin acts as a camouflage in the water: when predators (namely sharks, seals and occasionally, orcas) in deep waters look upwards, they see the penguin's white underbelly reflected against the bright African sun; for predators looking down into the dark water, they see the black backside. Like many other African species, the African Penguin has also faced serious threats to its existence. Due to the harvesting of eggs for food and destruction of habitat, the African Penguin was almost on the brink of extinction. Currently, the African Penguin is listed as a Vulnerable Species. 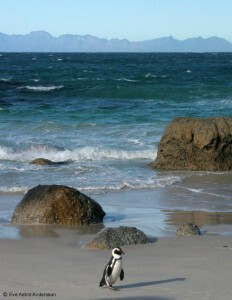 -The African Penguin is the only penguin species to breed in Africa and is not found anywhere else in the world. Heading up AWF’s membership desk for the past eight years, Erin Keyes has amassed quite a bit of knowledge about Africa’s wildlife and unique wild lands. She’s also an expert on AWF’s membership benefits and programs. She started this blog to share what’s she’s learned and to give AWF supporters another forum for asking questions. So, if you have questions about African wildlife, AWF’s work in Africa, or all the ways you can help Africa’s wildlife and unique wild lands endure, now’s your chance – just Ask Erin.